Photograph courtesy J Davenport 25252 drifts south towards Chesterfield station on August 28th 1979. During November/December 1979 25252 received minor attention at Derby Locomotive Works. 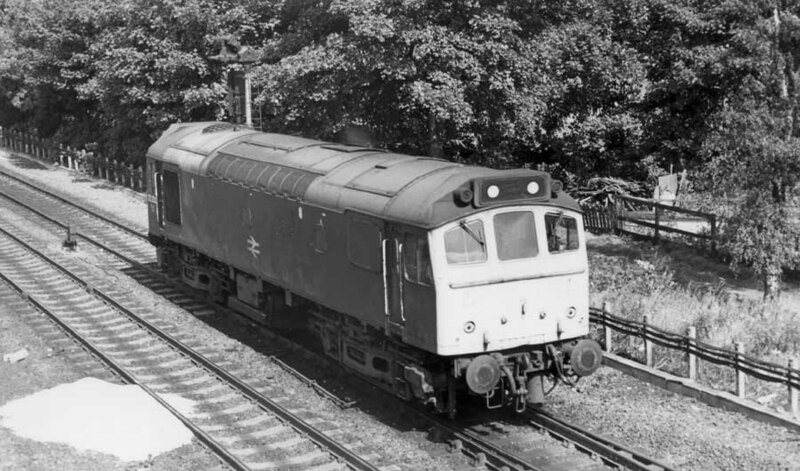 The fourteen year career of D7602/25252 included ten months in the Sheffield area, two & a half years on the Scottish Region, with the remainder of its time spent at LMR depots. Carried two-tone green livery with TOPS numbering (March 1974 - May 1975). Time between last Classified repair and withdrawal: 59 months. 25252 was the 29th Class 25 withdrawn, one of three retired during March 1980. After withdrawal 25252 was stored at Toton until August 14/15th 1980 when it was moved to Swindon Works. It was broken up here towards the end of September 1980. Noted Derby Works May 1975 (repaint in to blue livery). Noted Derby Works November & December 1979 (N5 repairs). Its two & a half years on the Scottish Region brought only a couple of recorded passenger workings, one being a brakevan special. On February 20th 1967 D7602 worked a Millerhill - Penicuik brakevan tour organised by the Melville College Railway Society, a grand total of 17 miles! Condition June: two-tone green livery with small yellow warning panels, no blanking plates, hand/footholds present, engine exhaust in original position, straight sided sandboxes, three rung bogie mounted footsteps. On June 21st D7602 worked a weedkilling train over the freight only Aviemore - Craigellachie line. All remaining traffic over this line would end on November 4th 1968. On May 26th 7602 & 5070 worked the 11.10 Glasgow Queen Street - Dundee. The completion of new LTE underground stock at Metro Cammell required the use of two specials to deliver the stock. These ran as the 23.42 Washwood Heath - West Ruislip on September 9th & 28th using Class 25s 7602 and 7548 respectively. The failure of a three-car multiple unit during the afternoon of November 14th saw 7602 & 7610 assist the 13.50 Chester - Wolverhampton service and the return working, the 16.35 Wolverhampton - Shrewsbury. With over ten years allocated to Bescot 7602/25252 acquired modest mileage on some familiar workings. Starting off the list of workings was a not-so-common job, on May 11th 25252 & 25054 worked the 09.35 Cardiff - Manchester Piccadilly forward from Birmingham New Street. Two weeks later on May 25th 25252 & 25143 worked the 12.52 Norwich - Birmingham New Street throughout. Condition August: two-tone green livery with full yellow ends, straight sided sandboxes, three rung bogie mounted footsteps, carrying TOPS numbering. Workings in 1975 included a day out to East Anglia on July 12th with 25252 & 25127 on the Derby - Norwich - Yarmouth - Norwich - Walsall diagram, covering a total of 370 passenger miles. A short working on September 6th was taking the 07.55 Leicester - Scarborough to Nottingham with 25236. The only recorded passenger working for 1976 took place on September 18th with 25252 & 25081 working the 08.00 Walsall - Yarmouth to Norwich and returning from there with the 14.15 Yarmouth - Derby. 25252 was the Manchester Victoria pilot on September 16th. 25252 was stabled at Severn Tunnel Junction on February 22nd. 1977 brought no recorded passenger workings but one week in July 1978 saw 25252 & 25101 quite active. On July 8th they worked the Walsall - Norwich (for Yarmouth) - Norwich - Derby diagram. The next three days (9th, 10th, 11th) saw them working the 08.40 Leicester - Skegness and 18.30 return. On October 30th 25252 was noted passing Perry Bar with a mixed freight. 25154 & 25252 worked a Mountsorrel - Kennett stone train on January 12th. 25252's last recorded passenger working took place during June 1979. On June 16th 25252 & 25270 worked the 08.00 Walsall - Yarmouth to Norwich, returned from there with the 14.15 Yarmouth - Derby. The next day the same pair worked the 08.25 Leicester - Skegness and 18.30 return. 25252 was noted passing Kisgrove with a short freight on September 11th. 25252 was withdrawn on March 30th 1980. Page added February 13th 2013.